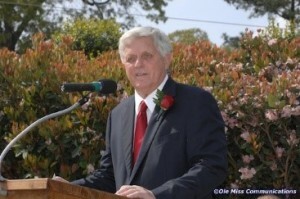 Encourage your colleagues and friends to make plans to attend the April 16 Legacy Award dinner, as the Ole Miss Women’s Council honors University of Mississippi Chancellor Emeritus Robert Khayat. Plans are well underway to ensure the evening is nothing short of spectacular, with Olivia and Archie Manning on board to emcee the evening. Mary Haskell is producing the program, which will include entertainment and tributes. Rose Flenorl will take the audience through Dr. Khayat’s journey from his early days in Moss Point, Miss., to his vast contributions to Ole Miss and his life today. The Manning Athletics Performance Center is to be transformed into an elegant dinner venue, with a much-anticipated meal prepared by talented Chef Joel Miller of the Ravine, an Oxford restaurant that staunchly supports local purveyors. A reception begins at 6 p.m., with the dinner following at 7 p.m.
Great appreciation is extended to C-Spire for its continued leadership as the presenting sponsor of the Legacy Award with $25,000 in support, and to Burson-Marsteller and the Gertrude C. Ford Foundation for being platinum sponsors each at $20,000 respectively. Additional sponsorships at several levels are available from $2,500 to $20,000 and include reserved tables and publicity inclusion. Invitations are set to be mailed March 1. OMWC and Rose Society members are encouraged to put together groups of colleagues and friends and reserve tables. A reserved table for 10 is $2,500; one for eight is $1,500; individual tickets are $150. Other related weekend events include a Friday evening Songwriters Soiree at the Lyric on the Oxford Square for event sponsors and Rose Society members. A Southern Fish Fry on Saturday is hosted by the School of Law, and all events feature Dr. Khayat as the honored guest. To learn more about sponsorships and tickets, contact Nora Capwell at 662-915-2384 or ncapwell@olemiss.edu.